Posted on September 11, 2018 by Kelly M.
Any chance we can trellis the earth to keep it from leaning further away from the sun? Because we need more daylight hours to bring in the fall crops! On the positive side, sales are strong, and we are spending the majority of our time harvesting tomatoes, beans and greens. Andrew delivered produce to Somerville Schools for the first time this year on Monday. Everything we send to Somerville goes into the salad bars at ten different schools, and this week students will enjoy Drumlin carrots, cherry tomatoes, radish, arugula, bok choi, and tat soi. Emma and Maggie recently met with the cafeteria team at the Cambridge schools to talk about our growing practices and preview the produce they’ll be receiving from us. The next few Mondays before first frost will be very busy adding these school harvests to our normal restaurant pre-harvests. Yesterday, we got help with this from volunteer Anne Patterson who, on her own, picked lots of purple and yellow beans. Thanks Anne! Visit our stand at the farmer’s market in Union Square in Somerville. This past Thursday, energy data analysts from ENGIE Insight helped us pick beans and potatoes for Saturday’s market. Their help gave us a big head start, and we finished Friday’s market harvest with a few minutes of daylight to spare. This was a big achievement because we were without the help of the students who have normally been harvesting with us on Friday afternoons, but who have now returned to school. The Crops Team then did an outstanding job selling the produce to the busy community in Union Square on Saturday, pictured above. 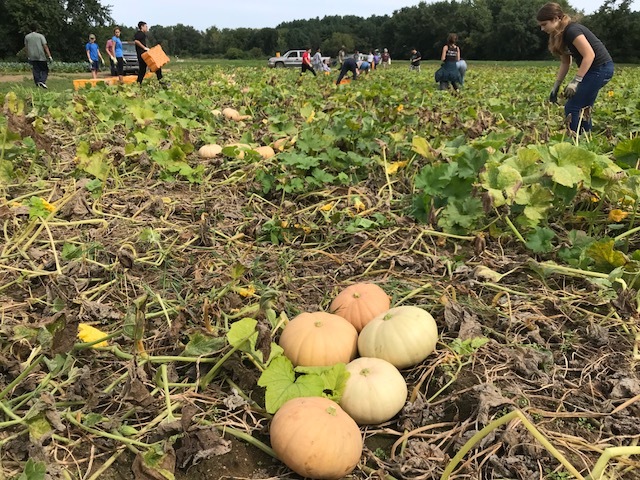 Back at the farm, the rest of the team worked with 30 Concord Academy freshmen weeding and harvesting winter squash (pictured below). Thanks to the helpful work from these students, we’ll distribute acorn squash in tomorrow’s first fall CSA share. There are still a few spots open for our Pick-Your-Own, Fruit Share, and full and half shares open in our Fall CSA, so register today if you haven’t already. Those that sign up after the first distribution can also join, receiving a prorated rate for the remainder of the season’s distributions. Acorn squash available at this week’s CSA share. While we’re hustling veggies out of the fields, we’re also plowing and seeding cover crops on vacated areas. Last night’s soaking rain means we should soon see oats and rye sprouting in the fields. So while fall colors are coming into the trees, the fields will be greening-up again. If you haven’t been out to the fields all season, this Saturday is a good time to visit as we are opening some beds to the public for picking as part of Drumlin Farm’s Fall Harvest Celebration. 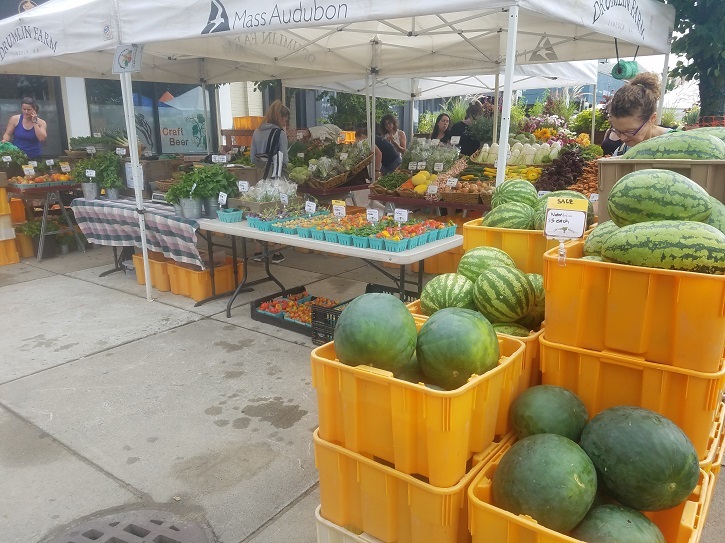 This entry was posted in Farming and tagged acorn squash, crops update, csa, farming, local food, volunteer on September 11, 2018 by Kelly M..